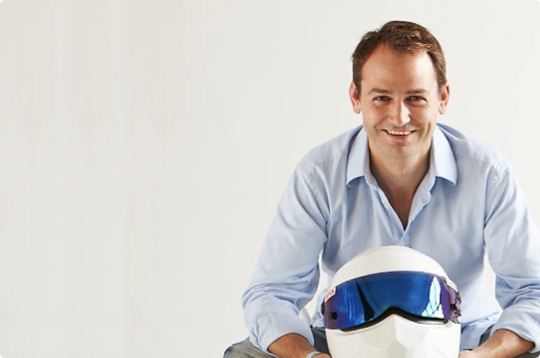 Better known as The Stig from BBC’s internationally acclaimed Top Gear program, Ben Collins has coached hundreds of celebrities such as Tom Cruise around the race track, organised high voltage car chases and tested hundreds of priceless cars to the brink. Ben holds many credits in his own name: A Professional Le Mans Racecar Driver, Bestselling Author, TV Presenter, World Record Breaker and Hollywood Stunt Driver. As the Stig, Ben Collins was the benchmark of speed against which all other drivers set themselves, and the man that everyone from Formula One World Champion Nigel Mansell to Jenson Button tried and failed to beat. He has raced successfully in almost every class imaginable, from Formula 3 and Le Mans 24 Hour competition to American Stock Car Racing. Jackie Stewart watching a young Ben win a Formula 3 race, was blown away, “When you see the likes of Ben Collins in Formula One, remember you saw them here first.” It was, however, the moment Ben disguised himself in white suit and helmet, that he became instantly recognisable. As a journalist, Ben writes for Autosport and The Sunday Times and is currently a presenter for Channel Five’s ‘Fifth Gear’ program. Ben’s bestselling memoir, The Man in the White Suit (The Stig, Le Mans, The Fast Lane and Me) charts a life of passion, commitment and a determination to succeed in the highly competitive adrenalin fuelled world of motor sports. .
Ben is an expert on driving and the mental aptitude required to be a professional in this highly competitive environment. He provides insights on what it feels like to race. A high pressure environment where split-second decisions determine success or failure, and total focus is the key to unlocking potential: skills that can be applied to the challenges of the workplace. Ben understands the complexities of the business world as well as the racing, His company continues to thrive under his leadership and provide ever greater spectacles of driving. He understands the importance of working as a team, having done so all his life- in the army and in the pit lanes and has effectively applied this to the world of commerce. Motor racing is a sport that thrives on new technology and is pioneering the energy systems of the future that will replace the use of carbon-based fuels. ‘High tech’ requires investment and Ben works continuously with the media and focused organisations to deliver funding for his racing programs. In the modern media landscape of ‘here today, forgotten tomorrow’, racing provides a visceral platform for corporate communication with Ben delivering at the sharp end on and off the track. Ben’s spent his early days as part of a local swimming team, where by the age of 7, he was swimming nationally at junior Olympic standard. In later life he passed selection to join an Elite Airborne regiment of highly-trained Army reservists, where he also served as an evasive driving instructor. And of course his hugely successful career in motorsports, covering his experiences of winning in Formula Three, NASCAR and Le Mans where he and his Team recently captured the Championship Title. Ben is in high demand as a speaker due to his unique career and continuing success. His entertaining anecdotes and tales of incredible stunts make for a truly inspirational talk. At its core is a story of strong commitment and an iron will that has determined Ben’s position as a world class performer. Alice Saunders at LAW with bookings enquiries. just wanted to say that I think the remarks that the three presenters of top gear have said since your departure are totally unjustified. Ive read your book twice now, and you come over as a thouroughly decent bloke. And fair play for joining the sas reserves whilst being stiggy at the same time. Ben, i was watching Top Gear this evening. Just wanted to let you know. You are the best. Hi Ben, saw you today at Thruxton in the Unipart tent, many thanks for a great day and some entertaining anecdotes! it was well worth the trip from Cornwall. top book by a top bloke i wish you all the best in the future! Hi Ben, just wanted to say I enjoyed your book as I am not technically minded (but not thick either) I was able to grasp the theory and enjoy the unusual mix of quest against adversity with ‘fbr’ and high performance machines/glitterati. So please do give us another instalment. Heroic drive in the RML HPD machine at Le Mans yesterday. Specifically a great performance during the last hour. Top gear and the STIG rule!!! I’m a big fan of the show. Please, back to Top Gear! Thanks Ben for helping us with the simulator pCARS, I was very happy when he learned he would join the team, I’m your fan, I wish many victories and hope to ride like you someday. What a massive missed opportunity by North One (Fifth Gear). They had the 3 best drivers on TV and instead of making the most of it they allowed silly pranks to undermine what could have been a fantastic showdown of spectacular drivers. I run the UDC (Ultimate Drifting Championship) in Ireland. Come over and play with us and I can assure you, you will be treated like the star you are.